This article is about the novel. For other uses, see Misery (disambiguation). Misery is a 1987 psychological horror thriller novel by Stephen King. The novel was nominated for the World Fantasy Award for Best Novel in 1988, and was later made into a Hollywood film and an off-Broadway play of the same name. 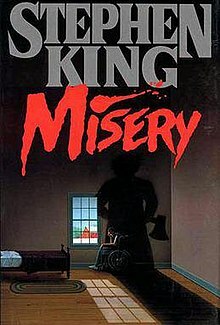 When King was writing Misery in 1985 he planned the book to be released under the pseudonym Richard Bachman but the identity of the pseudonym was discovered before the release of the book. The novel focuses on Paul Sheldon, a writer famous for Victorian-era romance novels involving the character of Misery Chastain. One day he is rescued from a car crash by crazed fan Annie Wilkes, who transports him to her house and, once finding out what he has done to Misery in his latest book, forces him to write a new book modifying the story – no matter what it takes. Paul Sheldon, the author of the best-selling series of Victorian era romance novels surrounding the character Misery Chastain, had just finished the manuscript of his new crime novel, Fast Cars. He has an alcohol-induced impulse to drive to Los Angeles rather than fly back home to New York City, but is caught in a snowstorm in a remote section of Colorado, causing him to drive off a cliff and crash into a snowbank. He awakens to find that he has been rescued by Annie Wilkes, a former nurse living nearby. Annie is an avid reader of Paul's Misery series, proclaiming herself Paul's "number one fan." She refuses to take Paul to the hospital despite his having two severely broken legs, nursing Paul herself using her stockpiled food and illicit stash of codeine-based painkillers, to which he quickly becomes addicted. When Annie finally reads Misery's Child, the last book in the Misery series, Annie learns that Paul has killed protagonist Misery Chastain off. She falls into a rage, leaving Paul alone in her house for over two days, sending him into withdrawal and a semi-comatose state. When Annie returns, she forces him to burn his new manuscript – which he hoped would launch his post-Misery career – and presents him with an antique Royal typewriter, for the purpose of writing a new Misery novel that will bring the character back from the dead. Biding his time, Paul begins a new book, Misery's Return, and allows Annie to read it as he writes. He manages to escape his room in a wheelchair on several different occasions, searching for more painkillers and exploring the house. He discovers that her telephone does not work, and finds a scrapbook full of newspaper clippings, suggesting that she is a serial killer who has murdered over thirty people, and was charged but acquitted of killing infants at a Boulder hospital maternity ward. Meanwhile, Annie grows increasingly depressive, and reveals that she knows about Paul leaving his room. She punishes him by cutting off his foot with an axe (hobbling) and cauterizing his ankle with a blowtorch. Later, when Paul complains about the typewriter breaking down, she cuts off his thumb with an electric knife. A Colorado state trooper eventually arrives at Annie's house in search of Paul, and when Paul attempts to alert him, Annie murders the trooper by running him over with her riding lawnmower. She temporarily hides Paul in the basement while disposing of the body and car, where Paul steals a can of lighter fluid. After being moved back into the bedroom, Paul finally finishes Misery's Return. Annie arrives to read it, only to find that he has doused the manuscript in lighter fluid and lit a match to burn it before she can read it. While Annie tries to put out the flames, Paul attacks her with the typewriter and they engage in a violent struggle, in which Annie hits her head. Paul escapes the room but passes out, and upon awakening manages to alert officers who have come to search for the missing trooper. He warns them that Annie is possibly alive and in the guest bedroom, and passes out when they tell him the room was empty. Later, it is revealed that Annie had escaped through the window and gone to get a chainsaw to kill Paul, dying from her head wound in the process. Returning home to New York, Paul submits Misery's Return to his publisher (it was revealed that he burned a decoy of the manuscript), which is set to become an international bestseller. Paul suffers frequent nightmares about Annie, and continues to have withdrawal from painkillers. He has also become an alcoholic with writer's block. Eventually, after a random encounter on the street, Paul gains inspiration to write a new story, weeping both in misery for his shattered life and in joy that he is finally able to write again. One of Stephen King's inspirations for Misery was the reaction his fans had to his 1984 novel The Eyes of the Dragon. Many fans rejected The Eyes of the Dragon because it was an epic fantasy book, with virtually none of the horror that initially made his reputation. Paul Sheldon feeling chained to the Misery books by his fans was a metaphor for King's feeling chained to horror fiction. Another source was King's addiction to drugs and alcohol, and his struggle to give them up. He stated: "Take the psychotic nurse in Misery, which I wrote when I was having such a tough time with dope. I knew what I was writing about. There was never any question. Annie was my drug problem, and she was my number-one fan. God, she never wanted to leave." When further addressing the idea of whether the character of Paul Sheldon was based on himself, King stated that in certain ways, he was, but in the ways where every character is a part of the author in some way: "It would be fair enough to ask, I suppose, if Paul Sheldon in Misery is me. Certain parts of him are ... but I think you will find that, if you continue to write fiction, every character you create is partly you." King has also attributed a dream he had while on a trans-Atlantic flight to London with the situation and characters that became fleshed out in Misery. He noted that he wrote the idea on an American Airlines cocktail napkin when he woke up so he could make sure to remember it, writing: "She speaks earnestly but never quite makes eye contact. A big woman and solid all through; she is an absence of hiatus. 'I wasn't trying to be funny in a mean way when I named my pig Misery, no sir. Please don't think that. No, I named her in the spirit of fan love, which is the purest love there is. You should be flattered.'" ... it would have made a pretty good story (not such a good novel, however; no one likes to root for a guy over the course of three hundred pages only to discover that between chapters sixteen and seventeen the pig ate him), but that wasn't the way things eventually went. Paul Sheldon turned out to be a good deal more resourceful than I initially thought, and his efforts to play Sheherezade and save his life gave me a chance to say some things about the redemptive power of writing that I had long felt but never articulated. Annie also turned out to be more complex than I'd first imagined her, and she was great fun to write about ..."
The novel was adapted into a film in 1990. James Caan and Kathy Bates star as Paul and Annie, with Lauren Bacall, Richard Farnsworth, and Frances Sternhagen as the only major supporting actors. Kathy Bates won the 1990 Best Actress Oscar for her performance. Director Balu Mahendra loosely adapted the novel into a Tamil film titled Julie Ganapathi in 2003. The novel was also adapted into a play by Simon Moore. The play premiered in London at the Criterion Theater in December 1992, starring Sharon Gless and Bill Paterson and directed by Moore. The play, directed by Alan Cohen, was revived in 2005 at the Kings Head Theatre in London, starring Michael Praed and Susan Penhaligon. In 2014 Dutch composer and theater producer Florus van Rooijen adapted the novel into a "feel bad" musical. A play written by William Goldman (who also wrote the film's screenplay) and directed by Will Frears opened on Broadway in 2015 for a limited engagement. The play starred Bruce Willis as writer Paul Sheldon and Laurie Metcalf as Annie Wilkes. It opened in October 2015 and ended on February 16, 2016. For her performance as Annie, Metcalf was nominated for a Tony Award for Best Actress in a Play. The play was originally premiered in 2012 at Bucks County Playhouse before moving to broadway. This new version is not connected to the earlier adaptation by Simon Moore. ^ "1988 Award Winners & Nominees". Worlds Without End. Retrieved 2009-07-24. ^ Delmendo, Sharon (1992). Slusser, George Edgar; Rabkin, Eric S., eds. Styles of Creation: Aesthetic Thechnique and the Creation of Fictional Worlds. University of Georgia Press. p. 177. ISBN 9780820314914. ^ a b c Beahm, George (1992). The Stephen King Story (2nd ed.). Andrews and McMeel. pp. 137–138. ISBN 9780836279894. ^ King, Stephen (2000). On Writing. Simon & Schuster. pp. 191–192. ISBN 9781439193631. ^ a b c d King, Stephen (2000). On Writing. Simon & Schuster. pp. 165–167. ISBN 9781439193631. ^ "Misery (Goodreads article)". Goodreads. Archived from the original on 2017-07-18. Retrieved 26 October 2018. ^ "Misery - een 'feel bad' musical" (in Dutch). Moker! Theaterproducties. ^ Barton, Steve (March 4, 2015). "Bruce Willis Headed to the Stage for Stephen King's Misery". Dread Central. ^ Gioia, Michael & Viagas, Robert. "Bruce Willis Will Make Broadway Debut in Misery, Based on Stephen King Novel" Playbill, March 4, 2015. Misery at Worlds Without End. This page was last edited on 2 April 2019, at 23:29 (UTC).